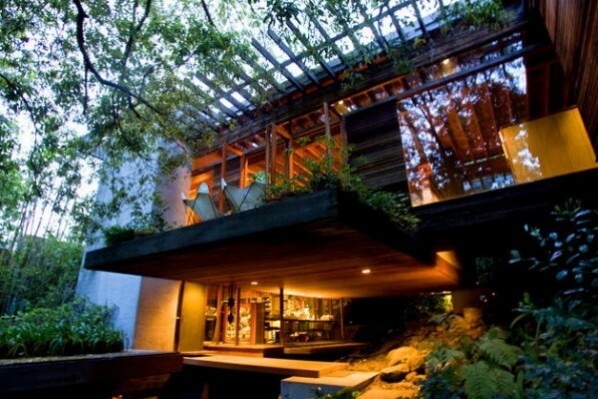 This notable home was designed & built by Ray Kappe for himself, in 1967. It’s located in Los Angeles’ Rustic Canyon. The multi-level wood and glass home runs along and over a hillside. It is also built to allow a natural spring to run through the property. “It is the quitessential tree house,” said Ron Radziner. In a survey of architects, scholars and historians, this home ranked among the 10 best homes in Los Angeles, according to The Los Angeles Times. This entry was posted on Thursday, November 18th, 2010 at 5:01 pm	and is filed under architecture & design. You can follow any responses to this entry through the RSS 2.0 feed.